Poppet Cheeks is an Etsy store which specialises in illustrated china plates, embroidery art and crochet + knitted jewellery/accessories. Items are crafted by Verity and her mum so the business is a joint venture which I think is really sweet! I've got 2 brooches to review, both of which are flowers! 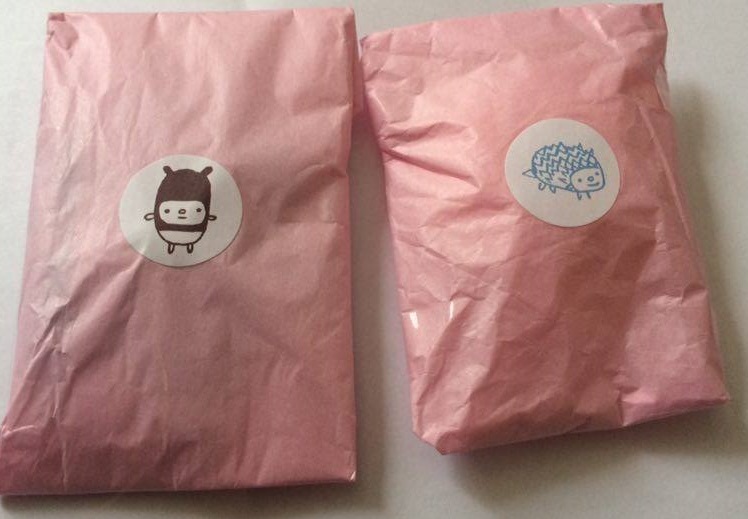 Upon opening my package, I was greeted by these two cute little pink baggies with the most adorable stickers on them. I'm a sucker for cute packaging and these are lovely. Considering the affordability of these items, it's soo great that such attention to detail is paid to the packaging and presentation of the items. Underneath the tissue paper, they're packaged in little ziplock bags which is awesome - it protects them from any water damage and keeps them nice and safe. The first brooch is a daisy in an aqua blue colour with a lovely patterned button sewed on the middle. Everything is very neatly done and the brooch backing is secured on safely. This is so pretty and such amazing value for only £4. I can't wait to pin this to my dungaree dresses and my Cath Kidston bags - it will look so adorable. The second brooch is a pastel peach rose. I'm in looove! This is such a unique colour for a brooch and it will look absolutely perfect on my denim dungaree dress with a cute blouse. I love brooches like this and this one really is unlike any I've seen in terms of it's beautiful colour! Again, this one is only £4 which I'm so impressed with. Everything is perfectly stitched and the back is on properly, I even gave it a tug to check as my pet hate is when backings are poorly secured and I end up losing my badge during the course of the day. Definitely go and visit Poppet Cheeks, the shop is adorable - there's so much choice on there and they take so much care in both their products and how they are packaged.